ElectronicKitSchool. - As we mentioned that one of the the popular and old the electronic circuit design and simulation software that called with Electronic Workbench or called with EWB. So, there are many student and the electronic hobbyist known about the EWB for more time and maybe this time they are still using this software. Electronic Workbench offer you many easy simulation for electronic project before you realization your project to real condition. In EWB there are many features that give you interesting to use and simulate many electronic circuit. Like other electronic simulation software, this software also provide you many virtual component and instrument to support your simulation. 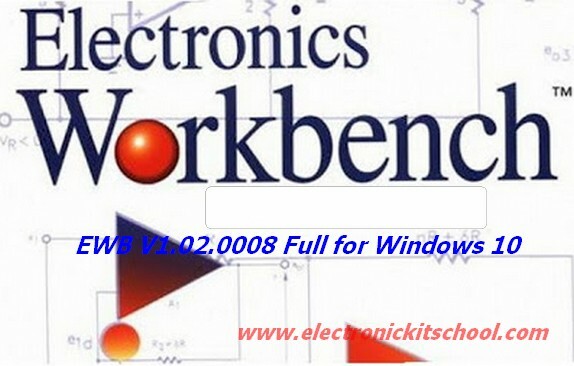 One of the version of the popular EWB in this time and still much sought is Electronic Workbench (EWB) V1.02.0008 Full for Windows 10 system. In this article we will give you global description about this software and then we will give you the many links to take free download Electronic Workbench (EWB) V1.02.0008 Full for Windows 10 system..
Electronic Workbench is a circuit simulation software for electronic project like analog and digital circuit project. This software very popular and surely make many easy for student and beginner of electronic hobbyist. With EWB we can be helped to understand and learn about the circuits. This software would help you to make electronic projects and also simulate it easily with many instrument tool in it's features. Plenty of tools are provided by electronic workbench you could use to draw your circuit virtually to ensure that you are doing correct the get to the final product. EWB provide many electronic component symbols like resistors, transistors, IC, inductors, LED, and other. These components will help you to create electronic circuit according your design. EWB also provide many tools to complete the simulation like input and output measurement. EWB provide AFG, frequency generator as an input devices for simulation. EWB also provide Oscilloscope, voltmeter, and other as an output device for simulation. With all component and device you can install it to simulate your electronic circuit. In here you look like do test in your real circuit. So, you also need power supply device to simulate your project. And you will know the result from the device indicators. So, it is nice. And now you can click the icon link below to continue download Electronic Workbench (EWB) V1.02.0008 Full for Windows 10. There are some files that you show download.